No prep dump and bake country captain chicken and rice is full of flavor and perfect for weeknights. There’s no prep work necessary for this easy weeknight dinner! 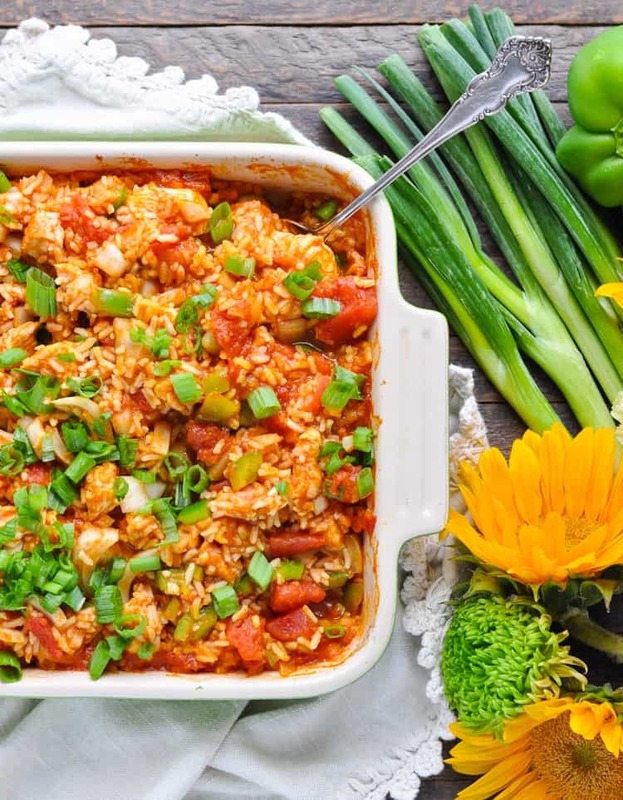 My Dump-and-Bake Country Captain Chicken with Rice is an updated shortcut on a Southern classic, and it’s ready for the oven in just 10 minutes! I originally included this recipe for Country Captain Chicken with Rice as an exclusive bonus for my email subscribers in my post, 30 Days of Dump-and-Bake Dinners. It’s so darn good, though, I figured it deserves a spotlight of its own! If you’re not from the South, or if you’re not familiar with Country Captain Chicken, then let me fill you in! 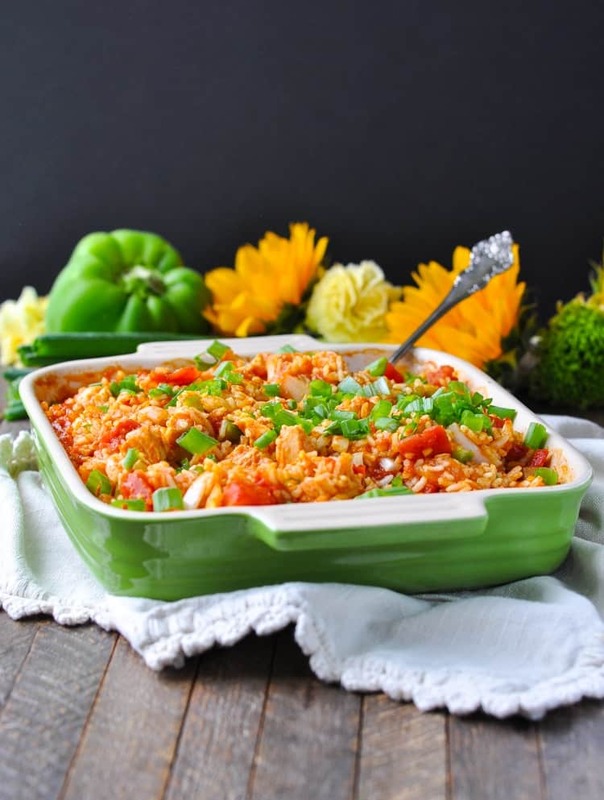 It’s a curried chicken and rice dish that was introduced to America through Charleston, Savannah, New York and Philadelphia, but has origins in India (source). The recipe has obviously changed quite a bit over the years, and any home cook probably has her own version that she swears is the best! Let me tell ya, though — you won’t need any other recipe once you’ve tried my dump-and-bake twist on Country Captain Chicken! It’s so full of flavor, but it’s also incredibly easy and gets you in and out of the kitchen in a matter of minutes! Original Country Captain Chicken is a mild stew made with browned chicken pieces, onions, and curry powder. A lot of chefs will add almonds, golden raisins, currants, tomatoes, garlic, and/or bell peppers. 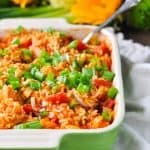 It’s almost always served over white rice, which is why I baked the rice right into my dish here! In addition to the chicken, curry, and rice, my shortcut Country Captain Chicken includes garlic, onions, bell peppers, tomatoes, and mango chutney (as a sweet-and-zesty nod to its Indian heritage)! Of course, you can toss in some golden raisins or sliced almonds of your own, or garnish it with sliced green onions like I do. It’s an easy dinner recipe that’s hard to mess up, and it’s a simple option that I know you’ll turn to time and again for a family-friendly weeknight meal. Enjoy, friends! 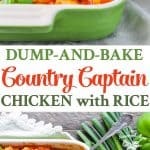 If you’ve tried this Dump and Bake Country Captain Chicken or any other recipe on The Seasoned Mom then don’t forget to rate the recipe and leave me a comment below! You can also follow me on Facebook, Twitter, Instagram and Pinterest to see what I’m getting up to. Preheat oven to 425F (220C). Spray a 9-inch square baking dish with cooking spray. In the prepared dish (or in a separate bowl) whisk together tomato paste, curry powder, garlic, chicken broth, and mango chutney. Add uncooked rice, onion, bell pepper, diced tomatoes (with juice), and raw chicken. Cover dish tightly with foil. Bake for 25 minutes. Uncover and give it all a stir. Return the dish to the oven, uncovered, and bake for an additional 5 minutes, or until chicken is cooked through and rice is tender. Let stand 5 minutes before serving. Garnish with optional toppings. Cooking Just for Two? 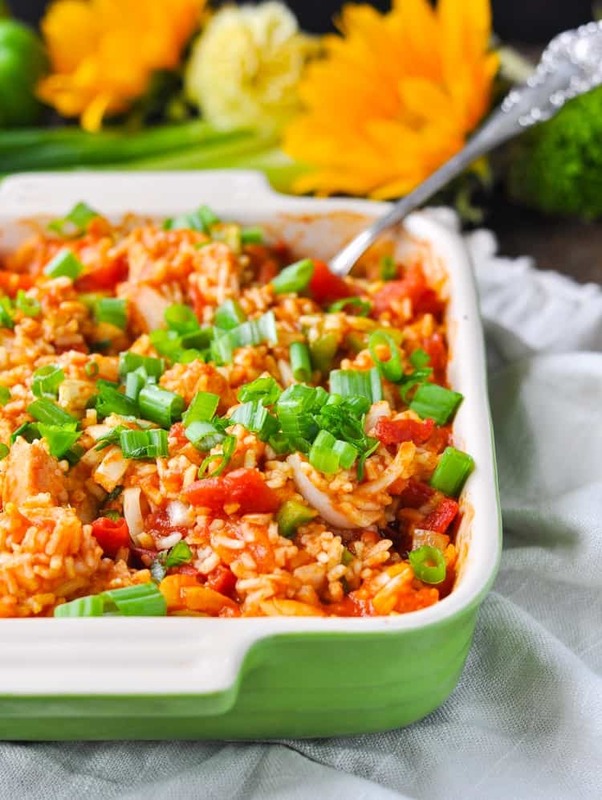 Cut all of the ingredients in half and bake the Country Captain Chicken with Rice in a 7-inch round pan (or any similar size baking dish that will hold about 2-3 servings). Thanks so much, Gayle! It’s a great combination of flavors! Sounds delicious! My family LOVES all of your recipes and they have saved me from being chained to the kitchen! Question: How can I substitute the instant rice with regular rice? Increase the liquid and bake time? I would love to prep it the night before and then bake it for dinner the next night but would the rice be all mushy? – Bake (covered) at 375 degrees F for about 60 minutes (or maybe as long as 75 minutes), until rice is tender. – Everything else can stay the same! If you want to prep ahead, I wouldn’t combine the rice with the other ingredients overnight (because you’re right — I think the rice would get mushy). Instead, I would combine the first 5 ingredients (the tomato paste through the chutney) in a small bowl and keep that covered in the fridge. Then dice the onion, the bell pepper, and the chicken and keep those 3 ingredients in a big Ziploc bag in the refrigerator. 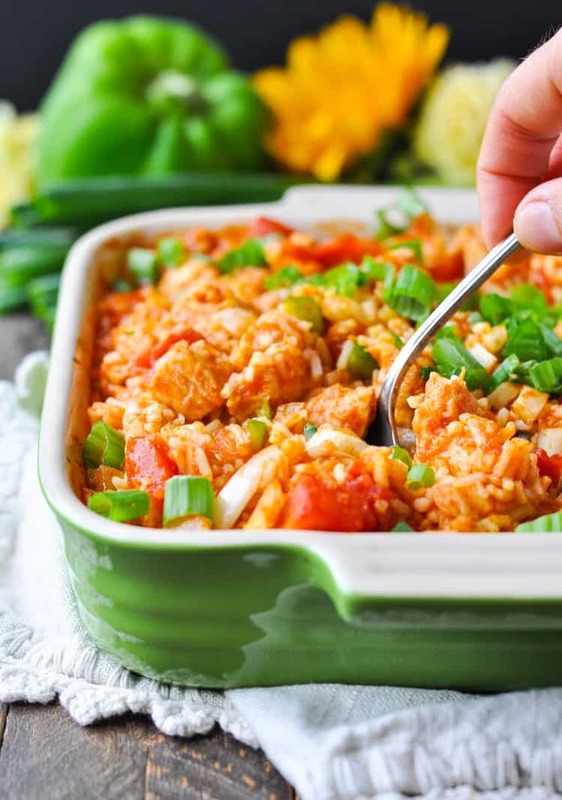 That way, when you come home from work and want to bake it the next night, you just need to stir together the liquid mixture with the rice, veggies, chicken, and tomatoes. Dump it in the pan and bake! There really won’t be any prep work at that point. Thanks for the tips! I will try it out this week and let you know how it turns out! Mmm, can’t wait to have my curry! Hi, Angelina! I can’t remember — are you in this country or are you abroad? Just about every grocery store in the US offers at least 1 type of mango chutney — I was surprised to even find it in our teeny-tiny little country grocery store here in Madison! 🙂 It’s either found on the jams/jellies aisle or with the international foods. ALL OF THIS. YES. OMG. LOVE how simple and delicious this is- perfect for busy weeknights! I’ve never heard of Country Captain Chicken but this sounds delicious! And so easy!! After a series of unfortunate events that wound up in FIVE separate trips to the grocery store for all the ingredients, I was desperately hoping it was going to be worth my time… and OH was it ever!!!! This is delicious!!! My first recipe of yours that I’ve tried but definitely won’t be the last! Can you use apricot preserves in place of the mango chutney?